1.Go to Komodo Edit download page and download the latest Linux version AS Package. (like Komodo-Edit-7.1.0-10496-linux-x86.tar.gz ). Copy your downloaded Komodo Edit .tar.gz file to your Desktop. Open Terminal.To open terminal click the Dash home from unity launcher.And type terminal in the search field.And click Terminal. Type the below code in terminal and hit enter. Note:Here 7.1.0-10496 is a version number.please change this with your version. Type your ubuntu password if needed. When prompted for the installation directory, type below path and hit enter. To set execution path Komodo Edit 7 environment, type below in terminal and hit enter. 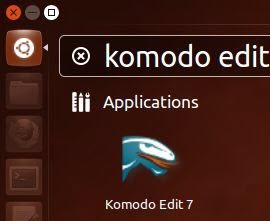 After the successful installation click the Dash home from unity launcher.And type Komodo Edit in the search field.Then click Komodo-Edit 7. Very helpfull, workded great for me!